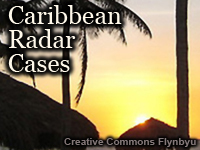 This module presents radar case studies taken from events in the Caribbean that highlight radar signatures of severe weather. These cases include examples of deep convection, squall lines, bow echoes, tornadoes, and heavy rain resulting in flooding. Each case study includes a discussion of the conceptual models of each type of event as a review before showing the radar signatures and allowing the learner to analyze each one. Yes. It was very much informative and it give me a better understanding in the area. great module, severe weather on radar, my favourite! Thank you : ) It's enjoyable. December 31, 2013: This update adds a fourth case study, Hurricane Georges to the lesson. The case focuses on the storm as it moved over the islands of Puerto Rico and Hispaniola on 21-22 September 1998. The case study highlights the importance of radar imagery in diagnosing the intensity of convective rainfall and the effects of terrain. The availability of radar data from research aircraft provides a more detailed view of the reflectivity and wind fields induced by complex terrain over Hispaniola.